More than 2 million preK-12 students take some form of schooling online right now--whether attending a virtual school for all their classes or just taking one or more courses via the Internet. But while the vast majority of students will continue to take all of their courses in physical classrooms over the next five years, the number of students taking courses online will jump to more than 10 million by 2014, according to data released recently by research firm Ambient Insight. According to Ambient Insight Chief Research Officer Sam S. Adkins, already about 450,000 K-12 students attend virtual schools or "cyber" charter schools full-time, while another 1.75 million take some of their classes online. The two groups are still outnumbered by students who take all of their courses in physical classrooms, which Ambient Insight reckoned at 50.03 million as of 2009. But this situation will change somewhat by 2014, at which time, Adkins forecast, the number of students taking all of their courses in physical classrooms will drop to 40.49 million, while 3.78 million will take all of their classes online, and 6.68 million will take some of their classes online. The information was presented in a Webinar that coincided with a new report from Ambient Insight focusing on the growth of the electronic learning market (in terms of dollars spent on products and services) from 2009 to 2014. Titled "US Self-paced eLearning Market," the new report highlighted some of the dominant segments in online learning. Of the individual segments spotlighted in the research, healthcare was projected to see the most growth over the next five years. But K-12 and higher education growth followed in second and third position, respectively, for a combined academic projected growth percentage greater than that of healthcare. K-12 was projected to grow about 18 percent by 2014; higher education was projected to grow more than 8 percent. Healthcare was projected to grow a little less than 20 percent over the next five years. "The rate of growth in the academic segments," said Ambient CEO Tyson Greer, in a prepared statement, "is due in part to the success and proliferation of the for-profit online schools." Across all segments, the market for electronic learning products and services, at present, is $16.7 billion. According to the report, this will grow at a compound annual growth rate of 7.4 percent over the next five years to $23.8 billion in 2014. 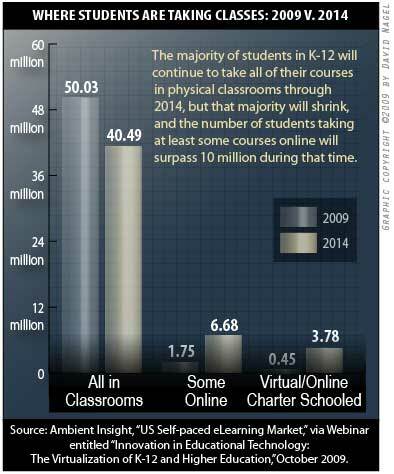 "In the past two years, the rate of growth for online learning products has slowed," Adkins wrote in a statement. "Yet, despite the recession, and in many cases, because of it, the demand is positive in all the online learning buyer segments....."
An executive summary of Ambient Insight's report, "US Self-paced eLearning Market," can be found here. The full report runs $4,825. Ambient will also be releasing a worldwide report on electronic learning in November. We'll have more information about that when it becomes available.